Saturday before last, one of two things happened: either the TSA stole my makeup bag, or I had left my makeup bag under the bathroom sink before embarking upon a 7 day vacation. (I favored the former because who could be that stupid, right? Of course I got home, and my makeup bag was indeed resting under the sink. Idiot.) Irregardless of how, I found myself about to leave the country for a week sans mascara and that simply wasn’t happening. One tiny panic attack and a good handful of tears later, my patient husband walked me to a Walgreens less than a mile from our hotel as I frantically flipped through every mental catalog I had of extreme drugstore makeup experiences and tips. Cheap was the primary name of the game here while trying to not sacrifice quality too much. My temporary makeup kit became a collection of products that I’d liked in the past or currently used, brands I at least trusted, and inexpensive products that I had previously read surprisingly good reviews for and was willing to make a gamble. Foundation is the anesthesia of makeup –you really don’t think about it unless the dentist starts drilling and it isn’t there. You don’t want people to look at you and notice your foundation. For this reason, I say it’s the most important thing to get right. After much deliberation, I went with this product solely based on reviews, and I was really happy I did. From the name alone you can tell it’s quite sheer (not a plus for me), but really buildable without getting cakey (major plus). I tend to favor heavier coverage foundations lately, but I admit I really enjoyed the flexibility of coverage this foundation provided. They aren’t messing around with claims to being lightweight pigment. For my olive complexion, it just wasn’t pigmented enough at all. I found myself using a ton of product to achieve the subtlest glow. The packaging also lacked, breaking and crumbling the second day of use (not fit for travel.) On sight, I also knew the tiny brush it came with would be useless -I wasn’t wrong. One of my all time favorite drugstore mascaras as non-waterproof, I wouldn’t want to keep the waterproof version around long term as a go-to. The formula seems much more thin and runny, making application a bit messy. In the end, it is inexpensive and does its job after the product sets. This I paid 89 cents for. I gave it a go based on random Pinterest promises of being “the best cheap pencil out there.” To that, and for less than a dollar, I just might agree. It seemed to stay in my waterline fine and didn’t smudge terribly with wear, although I can’t speak to it’s all-day durability as I only really put it on for evenings. It was also surprisingly smooth, not tugging at the lid at all like most cheap pencils. 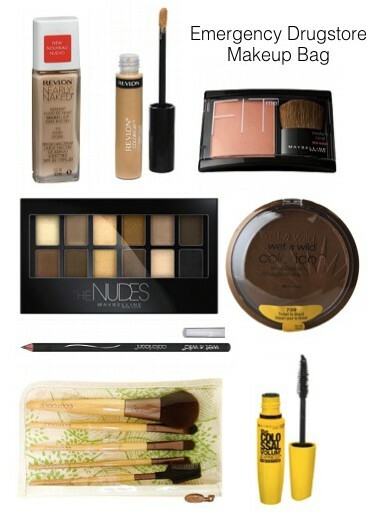 A neutrals junkie, getting to experiment with these shadows took the edge off forgetting my makeup bag. I’ve yet to find a drugstore palette so pointedly mimic the Urban Decay Naked Palette (my all time favorite go-to). Naturally not perfectly on par with Urban Decay, it was a very pretty palette with some lovely, decently pigmented basics for less than a fourth of the price. I plan on keeping this one handy. Shimmery but not sparkly, bronze without being orange -I was super pleased with this find. I couldn’t go on a beach vacation without a little bronzer, and found this little long lasting gem to be a great, cheap gut-feeling gamble. Just basic, cheap foundation application sponges. Better than using my fingers, and better than splurging for a low-quality foundation brush. Things I would have picked up had I not been so flustered: an eyelash curler and setting powder. Duh. Two of the most basic of basics. But guess what? I lived a whole 7 days without them. As ridiculous as I felt, please tell me I’m not alone. What is the most frustrating thing you’ve ever forgotten before vacation?